Okay. Deep breath. Here we go. Isn't it amazing that even years after the final Harry Potter book was published we, as fans, can still feel all of these...feels? I was wary to pick this up when it first came out for the simple fact that I LOVE HARRY POTTER A LOT. I wasn't sure how I would feel about this, even though I could read anything J.K. had her hands on, in, or around. This story starts off exactly where we left the gang: saying goodbye to their kids at Platform 9 3/4. We see the conversation Harry has with Albus and then...things change. As they get on the train Albus and Rose discuss finding a good compartment and Rose comments on how important it is to find the best one and that their parents met the first time on the train. Nostalgia, anyone? Well, one of the first people they see is Scorpius Malfoy. Rose wants nothing to do with him, so Albus joins Scorpius and an alliance is immediately formed. I've got to be honest with you, Scorpius was not what I expected. He was probably one of my favorite, if not my favorite, character. What happens next is a wide array of scenes that happen and fast forward a few years. Albus' fears come true as he is sorted into Slytherin and his relationship with Harry dwindles greatly. The parts of the story with Harry and Albus fighting and sniping hurt my heart so much. As the story unfolds and we meet new characters and get to see all of the old ones, you really do fall in love all over again. Ron and Hermione are still the same. We see a more grown-up but still fierce Ginny. Even McGonnagall is perfection to me. The plot was interesting, but not what I expected it to be. It's obvious that Harry still has so much guilt but it's also something that Albus doesn't understand. He doesn't know the whole truth of Harry's life. He thinks of having Harry as a father as a burden rather than a reward. Albus never feels good enough to be Harry's son, but Harry doesn't always help that feeling. The fact that Albus and Scorpius do what they do is really a testament to J.K.'s story. She writes brave and true characters. The boys really thought they were helping a sad, old man save his son. (I don't want to get too spoilery here.) In truth, they really messed things up, but did the right thing by trying to fix it. There were definitely some moments that brought tears to my eyes. Some little tidbits of the past that tugged on my heart a little too much. I don't think there will ever be a day when I don't love Harry Potter and the world that J.K. created. Some will find flaws in this, but others will love it simply for the universe it lives in. 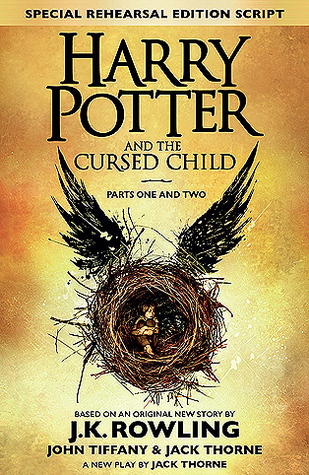 Thank you for letting us read it, J.K.